Thank you to all of the generous sponsors, golfers, attendees and BRF Board Members for helping to make the 2013 Baby Reesa Golf Tournament a HUGE Success!!! Reesa with Mom and Dad on the News!! 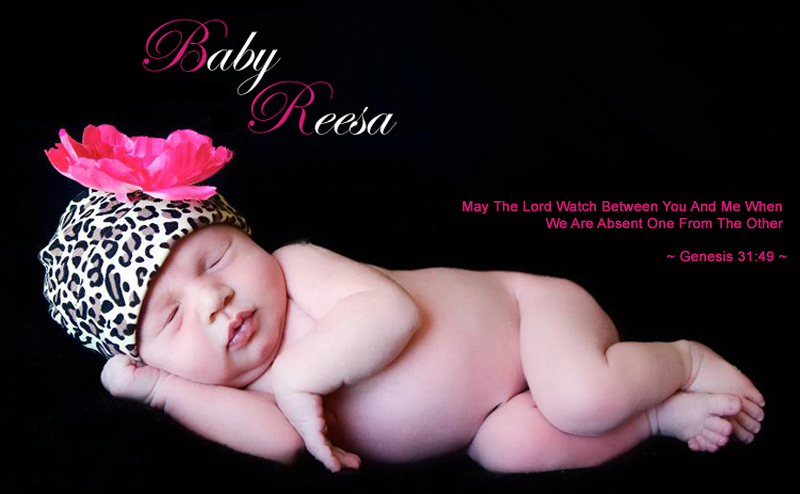 It has been a couple months since our last update on Baby Reesa. For the most part, Reesa has been well and her condition has remained stable. Over the last year we’ve come to realize that the progression of Krabbe Disease is unpredictable. Although we’re always battling Reesa’s spasms and nerve pain, she’ll go weeks where her discomfort is present but manageable. Then, seemingly out of nowhere, Reesa will have days of horrible pain, spasms, muscle twitches, fevers and high heart rates. Krabbe Disease is degrading the insulation around Reesa’s nerves and inhibits the signals between her brain and the rest of her nervous system. Reesa takes over a dozen medications per day for nerve pain, inflammation, spasticity, comfort, digestion, bone strength, etc. but there are times when all we can do is cuddle and love her until the pain goes away. She is such a strong little girl who inspires everyone that meets her. Reesa turns TWO on July 30th. She is such a big girl, 25 lbs, chunky and cute as ever. Reesa is surrounded by LOVE every day of her life. Her parents, grandparents and great grandparents can’t get enough of her! A couple weeks ago Reesa had family come all the way from Chicago to meet her. She loved spending with Uncle Glen, Aunt Laurie and Cousin Amy and we know they loved spending time with her. Reesa absolutely loves spending time swimming in the pool and it’s a good thing because there isn’t much else to do when it’s 110 degrees outside! Here are some recent pictures of Reesa enjoying the summer. We would like to dedicate this blog entry to all of the wonderful people that have become part of our lives and who make a tremendous difference in Reesa's life. When Reesa was first diagnosed, Hospice of the Valley came over to talk with our family. The one thing they encouraged was that if our jobs were supportive we should keep working to keep normalcy in our lives. If we were going to keep working we knew that we would need help during the day and at night. Grammy Flo has been there for us since Day One. She watches Reesa 3 days a week and we're so lucky to have her. In addition to Grammy we have also welcomed Nurse Angel and Nurse Stephanie into our home. When we first met Angel and Stephanie we knew they were a perfect fit for Reesa and our family. Angel has been a nurse for many years and has a lot of experience with children and although Stephanie didn't have as much experience with children, Reesa's story touched her because a family member has a similar disease and she was eager to work with Reesa. When looking for a nurse we wanted someone that would take amazing care of Reesa and would love and care for her just like a family member. Angel was a perfect match! She watches Reesa 2-3 days per week. She is so patient with Reesa and loves dressing her up like a little doll. Angel not only takes wonderful care of Reesa but she is very proactive with her which is important because any small change in Reesa's behavior can be a sign that something is going on that needs immediate attention. Reesa loves when Angel sings to her and of course loves when they snuggle. Our night nurse, Stephanie, is also wonderful with Reesa and she allows us to get a full night sleep. Stephanie stays up and cares for Reesa by administering her meds throughout the night, suctions her as needed and periodically repositions her so she doesn't wake up with cramps. When Reesa decides she doesn't want to sleep she loves to snuggle with Stephanie late at night in her rocking chair. Stephanie recently started working with Reesa every other Friday (during the day) which is working out great. Reesa is always busy with visitors throughout the day. Every Monday and Thursday she has physical therapy with Cristina. The stretching and positioning done during Physical therapy help keep Reesa healthy and improve her quality of life. Reesa also works with Regina, a developmentalist, on Tuesdays. Regina stretches Reesa and also provides visual and auditory stimulation using the iPad with music and coloring apps. Reesa's pediatrician is Dr. Barcellona. Dr. B is very compassionate and accessible at all hours. He also works closely with Dr. Maria Escolar at Children's Hospital of Pittsburgh. Dr. Escolar is the Director of the Program for the Study of Neurodevelopment in Rare Disorders. She and her team are experts with regards to Krabbe disease and direct us on all of Reesa's needs, including medications, equipment, therapies as well as monitoring the progression of the disease. Dr. E's nurse practitioner, Tara West, is there to support us literally any hour of the day. She has helped us get through many situations ad we can't wait to meet her in-person in April when we go for Reesa's next visit!